Weekend brunch has definitely settled in with the Barcelona crowd. More and more bars and restaurants extend their menu with a brunch on the weekend and new trendy places pop up all over town. There’s nothing better spoiling yourself with some sweetness on the weekend, so I also got hooked on the brunch trend. One of my friends invited me along to Granje Petitbo and I was pleasantly surprised. Because it is one of the nicest brunch hotspots I have visited so far. Petitbo has a nice vintage vibe and it’s beautifully decorated with old furniture. The big windows allow a lot of light inside, making it a bright and inviting space. I love it, as it is trendy, simple and well designed, which isn’t always easy to find in Barcelona. Since brunch became so popular, the better places are always very crowded and sometimes even have queues. Granja Petitbo is a little outside the main city centre, and although popular it wasn’t too crowded when I visited. However you can’t make reservations, so you might have to wait a bit. 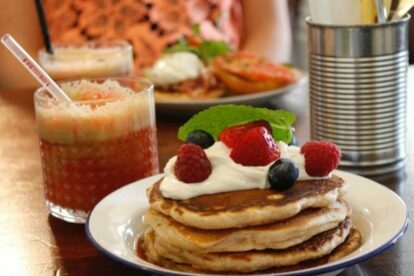 I have a sweet tooth and simply loved the pancakes with red fruit and vanilla cream. But they also offer savoury plates, and they looked amazing! Brunch is only offered on the weekends, but during the week it is also open for lunch and dinner. Judging by the many dishes I saw passing by, I am sure that any time of day they’ll have something delicious to offer.